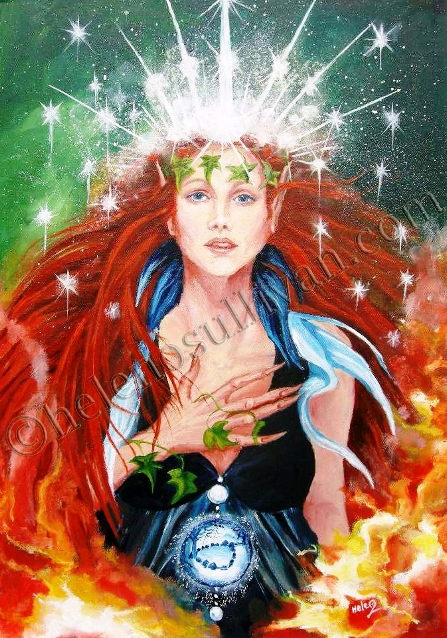 Aine (brightness, glow, joy, radiance; splendour, glory, fame) is the Irish Goddess that is celebrated at Midsummer. She is also known as the Faery Queen of Munster and is said to live at Knockainy Hill. Originally, Aine was a Sun Goddess and she assumed the form of Lair Derg (“red mare”) which was a horse that no one could outrun. Fire rites and blessings of the land were performed at Knockainy Hill in Her honor, particularly at the time of Midsummer. Aine also has a sister, Grian, who may be a manifestation of the Goddess Macha. Grian presides over the dark half of the year and Aine over the light half of the year. Áine is the Summer Goddess as well as being the Fairy Queen, so it is important to connect and leave gifts for the Devic realm. The interweave of their energies and ours is part of the fabric of our living Mother. Áine carries the fire that initiates life force in which She impregnates this germ of life into the growing fruit that will become our harvest. She also awakens the life force within ourselves. Áine is connected with sovereignty, as She claims the land unto Herself for the three days around the Summer Solstice. Traditionally, people would walk around Cnoc Áine (hill of Áine) on the night before the Summer Solstice, with touches, to call Áine to join them and bring the sun and life force to themselves and their fields and stock. Áine is often seen as a Triple Goddess with Her other two faces being the mermaid and the crone, both connected with Loch Gur, by the hill.